The gallery is located on the second floor of the fivestar “Hyatt Regency” hotel. Products of domestic and foreign craftsmen are represented in the gallery. Here you can buy paintings, graphics, woodcarvings, jewelry, natural stone products, ceramics, pottery, photography, books, postcards, glasswork, embroideries, textiles, ikat home wares and accessories, mohair and cashmere products, clothing made from traditional textiles, carpets, and other ethnic crafts. “Rukhom” is translated as onyx – the stone of Kings. “Rukhom” was founded in 1994. The main activity of the company is to manufacture products from raw gems: beads, necklaces, bracelets, charms, pendants,earrings, candlesticks, vases, desk sets, jewelry boxes, and mineralogical collections. The company opened a shop where you can the items produced by “Rukhom” from Tajikistan’s semiprecious stones. was established at the Institute of Fine Arts and Design of the Republic of Tajikistan. The gallery features arts and crafts of Tajikistan: ceramics, painting, textiles, graphics, miniatures, kundal, wood carving, etc. All available products are made by leading professors of the Institute and their students. This shop features products made by Tajik and Pakistani craftsmen. In the gallery you can see a variety of wood products that have been masterfully decorated with national ornaments using traditional wood carving techniques. 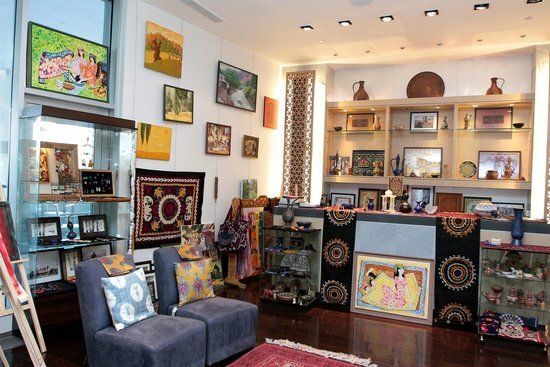 In this gallery you can find and purchase traditional, Tajik style souvenirs of good quality. The master craftsmen combine functional items from daily life with national style. Products purchased in this gallery will be a memorable gift.